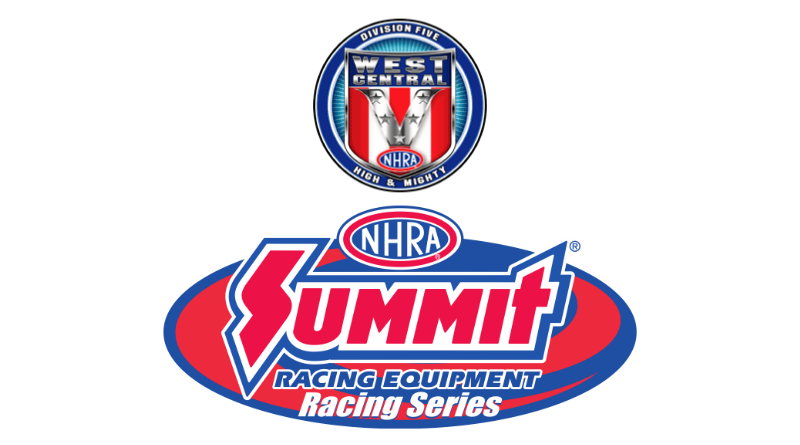 TOPEKA, Kan. – SRCA Dragstrip racked up 55 points to capture the Team Championship and five individual winners are heading to the NHRA Summit National Championship via wins this weekend at the NHRA West Central Division Summit Racing Series. SRCA drivers held off those from Brainerd International Raceway and Bandimere Speedway who finished in second and third with 50 and 41 points respectively. Jaron Miller, Joe Marx, Brent Erickson and Beau Drexler each won their respective category and now advance to the National Championship in California where they will face off against the winners from NHRA’s six other divisions. Joining the four will be Tanner Asti who won Friday’s Race of Champions competition. In a special wild card drawing earlier this year, the West Central division was drawn to send their Sportsman ROC winner to the national championship and fill out the 8-car field. Chris Livingood, Ottawa, Kan., was out first on Miller in the Super Pro Final but it was Miller, Chase, Kan., with the power to take the win and the trophy in his ’08 dragster. Marx and Erickson won in Pro and Sportsman respectively. Marx got the holeshot on Bob Ingman in a Minnesota battle as Marx, St. Michael, Minn., drove his ’71 Duster to a 10.835 second, 121.61 mph lap in beating the quicker Ingman, Andover, Minn., and his ’70 Cougar at 10.372, 127.22. Erickson was better at both ends of the track as he faced off with Korbynn Stallbaumer. The Omaha, Neb., Erikson posted a 12.092 second run to Stallbaumer, Wakarusa, Kan., who went 12.192. In ET Motorcycle, Drexler was .012 seconds off the start and then posted an 8.597 on the 8.59 dial for the win over Michael Shelton of team champions Great Bend, Kan.
Jesse Nelson rounded out Saturday’s winners taking home the bragging rights in the High School class. Garrett Nichols, Wichita, Kan., left early with a foul start as Nelson ran it out on his victory lap to a 12.362, 107.90 in his ’68 Mustang. In the Race of Champions action Asti punched his ticket at the start as Kevin Nemitz left early giving the Henderson, Colo., racer the win and a chance at the NHRA Summit National Championship. Asti clocked in at 13.460 at 101.50 in his ’03 GTP. Raile and Eric Johnson had identical great reaction times at .008 in Pro with Raile just a tick better at the top end to win by a hundredth of a second running 10.133 to Johnson’s 9.364. Schlep, Emporia, Kan., won on a double breakout in Motorcycle posting an 8.958, 134.86 mph run to Jimmy Paulson, Stacy, Minn., who clocked in at 9.166 134.91. Burger took home the honors in the High School ROC as he was better at both ends of the track than Sadie Shriver, Auburn, Neb. Burger went 12.467 on the 12.46 dial to Shriver’s 112.322. Jaron Miller, Chase, Kan., ’08 American, 7.654, 167.59 def. Chris Livingood, Ottawa, Kan., ’81 Malibu, 10.092, 129.62. Joe Marx, St Michael, Minn., ’71 Duster, 10.835, 121.61 def. Bob Ingman, Andover, Minn., ’70 Cougar, 10.372, 127.22. Beau Drexler, Lakewood, Colo., ’90 ZX9, 8.597, 146.53 def. Michael Shelton, Great Bend, Kan., ’09 Busa, 9.451, 138.53. Jesse Nelson, Boeulus, Neb., ’68 Mustang, 12.361, 107.90 def. Garrett Nichols, Wichita, Kan., ’74 Cutlass, foul. Mike Secrest, Wichita, Kan., ’11 White, 7.071, 184.22 def. Joe Wolf, Pierre, S.D., ’08 Worthy, 7.531, 175.98. Ryan Schlep, Emporia, Kan., ’12 Kawazaki, 8.958, 134.86 def. Jimmy Paulson, Stacy, Minn., ’13 Clampit, 9.166, 134.91. Devin Burger, ’87 Dakota, 12.467, 102.05 def. Sadie Shriver, Auburn, Neb., ’92 Dakota, 12.322, 99.59. DragChamp.com is your source for drag race results online. Check DragChamp daily for all your E.T. bracket racing news.